Finally had chance to get the solar panels installed in Ensenada. After much measurement we figured we could add a third solar panel to the two we originally had bought back in San Francisco. 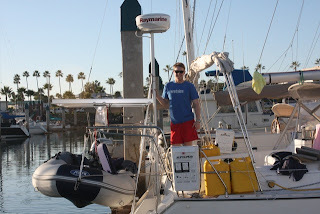 I ordered it while we were in San Diego and now have just over 700 Watts of solar for Solent. Should give us plenty of power. I had some lengths of Aluminum cut for the panels to be mounted to and they installed relatively easily with help from Lewis. The structure isn't as stable as i'd like so i'm going to get some additional mounts and tubing to give it extra support. Fitted the solar charge controller next. Went with a new product the Midnite Solar Classic which looks to be a great unit. 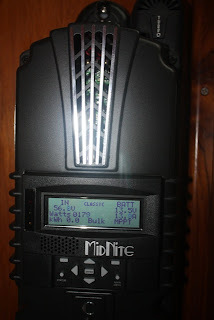 It has web access and you can access the unit on the internet to see what power your producing remotely. 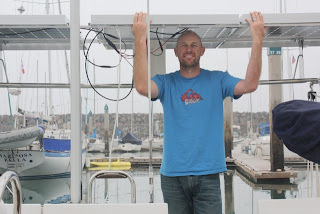 When we installed it the weather was cloudy so we haven't been able to see what we will get on a typical day, but was still able to get a peak of 250 Watts on cloudy days and had charged the batteries for the last days consumption by lunch time. Anyway will post what we get on a sunny day once we have one, which should be tomorrow.